Live the world! The Rucksack Universe is the exciting world of wit, adventure, and beer for the anywhere and armchair traveler. 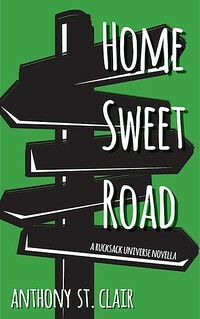 Fans and reviewers say the series has “universe building reminiscent of Terry Pratchett,” and are full of “quirk, wit, travel, and magic.” The Sword and Laser Podcast calls it “the invention of beerpunk.” Enjoy this ongoing, non-sequential urban fantasy travel fiction series wherever e-books and books are sold. If you don’t see the Rucksack Universe in your favorite bookstore, they can look it up and order it for you. Influencing a man’s fate should have been another day behind the bar. The world’s fate hangs on one untested woman. Their entwined fate becomes his impossible choice. A strange eclipse looms above India’s city of the smiling fire. When an ancient evil awakens, the world teeters on a razor’s edge of life and annihilation. As fires rage in a land of ash, a backpacker, a bartender, and the world’s only Himalayan-Irish sage become trapped between their entwined fate and an impossible choice. What do the Eiffel Tower and Angkor Wat have in common? What order should the series be read in? The Rucksack Universe is an ongoing, nonsequential series (kind of like Terry Pratchett’s Discworld). You can come to the series from any book and be fully immersed in the story.